Ivan Cappiello (icappiello) closed T62895: Rigify: IK2FK / FK2IK - not working on 2.8 as Resolved. i am closing this as resolved since after more than a week no more issues are reported on the topic and @Alexander Gavrilov (angavrilov) fix in Fix T62284: apply a retroactive fix for T57366 to old files. can take care of most cases. Ivan Cappiello (icappiello) created T63463: 2.8 auto/manual upgrade rig-ui for Rigify. Ivan Cappiello (icappiello) added a comment to T62895: Rigify: IK2FK / FK2IK - not working on 2.8. One thing is, now that Rigify supports external rig packages, you have to ask the question why everything has to be in base rigify? E.g. the legacy rigs can be converted into a feature set package that can be used with new rigify enabled. in both systems the space switching is very limited, I modified a new rigify rig to allow multiple spaces in a more flexible way: with the help of @Julien DUROURE (julien) 's add-on to create space switches, with a bit of tweaking of the rig, now each controller has several different spaces that the animator would usually need like: head, chest, hips, cog (center of gravity), root. I have replicated the process manually but instead of a dropdown with just a slider that indicates different spaces like: 0 root, 1 torso, 2 hips.... etc. Here is a sample video of the one i created with Juliens add-on. first a question: will the legacy rig be ported as a rig to the new rigify, so we can get rid of the legacy one as a different setup and have it all unified into one?, be able to mix the old pieces with new ones would be beneficial in many ways like being able to use the "new coloring setup", and bring old rigify pieces to the new rigs that used to work better in some case. Ivan Cappiello (icappiello) updated subscribers of D4624: T63138: redesign generate.py and introduce a base rig class..
i'd like to have an opinion on this from @Campbell Barton (campbellbarton) and @Nathan Vegdahl (cessen). They are the authors the original rigify framework. Ivan Cappiello (icappiello) claimed T54100: Animal Horse rig. the thing about the buttons is that FK2IK Action and IK2FK Action should snap all the FK keys to the IK positions, and the IK to the FK positions, but now it's vice versa. In contraposition the FK2IK & IK2FK Pose buttons are correct. There’s a difference between the two functions. If you read the descriptions overing the mouse on the buttons it will be clear. • The pose buttons are intended to snap, so ik2fk means snap the ik to the fk position. • The action button are intended as bake, so ik2fk action means transfer the ik action to the fk controls. This is also similar ti what telhe operator calls inside the code actually using blender’s bake operators. Ivan Cappiello (icappiello) raised the priority of T62895: Rigify: IK2FK / FK2IK - not working on 2.8 from Confirmed, Low to Confirmed, High. "The buttons to transfer animation from one to the other dont work, also they are named incorrectly the one to transfer from IK to FK is named FK2IK and vice versa"
In my tests there's no error on newly generated rigs, but still seems it just does nothing at all. This will require a more in depth investigation. Hope @Lucio Rossi (luciorossi) find some time to have a look at it. Ivan Cappiello (icappiello) triaged T62895: Rigify: IK2FK / FK2IK - not working on 2.8 as Confirmed, Low priority. This is more a backward compatibility issue. The affected part is the rig-ui and Rigify tools python script generated in previous versions. Ivan Cappiello (icappiello) updated subscribers of T54159: Bake Actions causes skewed bones on Rigify armature. the addon by @Paolo Acampora (pkrime) posted in https://developer.blender.org/T57536 seems to address the issue in our tests. As for now it's destructive for the rig itself but can easily be modified to create a non destructive workflow like creating a data block copy of the original rig armature, make the bake on the reparented bones armature created by the script and after the export reassign the original rig data block to the armature object. Ivan Cappiello (icappiello) closed T60676: Rigify Error HELP as Invalid. Ivan Cappiello (icappiello) closed T61711: Basic Rigify Spine 2.8 won't successfully generate as Resolved. and fix it if you can? Ivan Cappiello (icappiello) closed T62013: Rigify error, elaboration please as Invalid. This is not a Rigify bug. Cannot reproduce it except generating from your file. This usually happens when you remove/unparent/parent some face bones. Unfortunately the current face sample has this limitation: you can only move the bones to correct position according to your model. You cannot rename/unparent/remove any bone or the generate function will fail. This is going to be addressed in rigify 0.6 but for now the easiest way to fix is remove completely the face bones (make only armature layer 1 visible, select all bones on layer 1 and delete it) and re add a face sample (in edit mode select and add the superface sample). Then reposition the bones paying attention to not remove or reparent anything except for the small face bone that has to be parented to the spine.006 bone. Moreover, you should either apply the scale in object mode since the armature object appears to be scaled up as pointed in previous posts. Ivan Cappiello (icappiello) added a comment to T62284: Import rigify character from 2.79 into 2.80 yields no shapes. @neil richmond (neilford) you should probably change the tags or create a new task if you want this to be solved quickly. This should be handled by blender itself onload. All armatures using shapes are affected. it's not an add-on related bug. 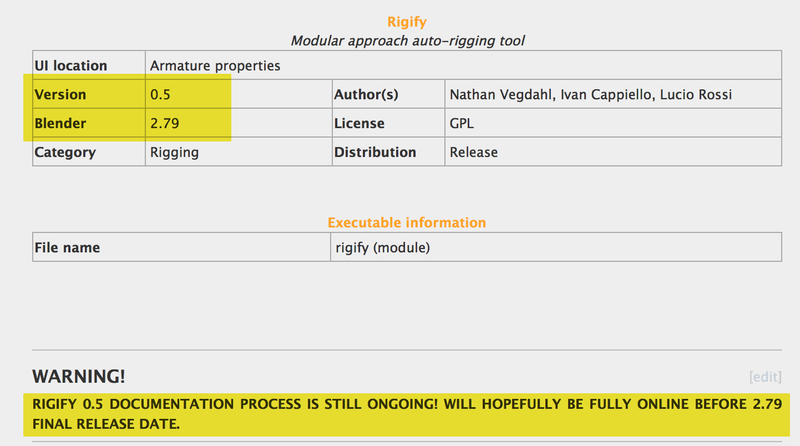 Ivan Cappiello (icappiello) closed T52758: Rigify: feature proposal: allow registration of custom rig types as Resolved. Ivan Cappiello (icappiello) created T62565: conflict with how Blender is sampling OSX input/stroke events. Ivan Cappiello (icappiello) closed T54058: Rigify - Cat setup suggestions/fix as Invalid. Ivan Cappiello (icappiello) accepted D4364: Rigify: add support for user-defined rig packages and related utilities..
Just tested this successfully. I'd like to polish a bit the 'Feature Set' panel, but that's way over this task's topic. Ivan Cappiello (icappiello) updated subscribers of rBa819ef65c071: Fix for T48988 - Enabling bbone easing for posemode. Ivan Cappiello (icappiello) added a comment to rBa819ef65c071: Fix for T48988 - Enabling bbone easing for posemode. Ok, in rB5d96bc9c5a2 I've added version patching code to fix old RNA paths so that old animation/drivers will work. Ivan Cappiello (icappiello) updated subscribers of T61711: Basic Rigify Spine 2.8 won't successfully generate. Ivan Cappiello (icappiello) created T61711: Basic Rigify Spine 2.8 won't successfully generate. Ivan Cappiello (icappiello) added a comment to D4364: Rigify: add support for user-defined rig packages and related utilities..
there are two misleading information in this thread. I'll post this for other people eventually coming here reading. I don’t understand what you are trying to do, Alexander's branch is for 2.8 as implied in the branch name, right? What worked for me was to apply this patch directly to the current Blender 2.8 Addons repository. I've got a feeling you are under an impression that https://github.com/eigen-value/rigify/tree/rigify_0.6_beta is for 2.8 - that's wrong. I can’t test on Mac OS, but it works for me on Linux when applied upon the latest commit. @Damien Picard (pioverfour) please download the 0.6 beta and test it. Should be updated to your recent pulls (except for pantins related commits). If it works then it's os-related, if not, you probably did some modification to without stashing the related commit, so in that case we need to pull that too (without pantins related commits). My external rigs work with the expected minor modifications (mainly the matrix multiplication operator). This is happening way before, just clicking on the add-on enable button. So to be clear rigify is not loaded at all. Ivan Cappiello (icappiello) added a comment to T52758: Rigify: feature proposal: allow registration of custom rig types. Ivan Cappiello (icappiello) updated subscribers of T60461: Rigify: Fix displaying multiple rig layer panel with older blend file. Blender 2.8. Ivan Cappiello (icappiello) added a comment to T60461: Rigify: Fix displaying multiple rig layer panel with older blend file. Blender 2.8. Ivan Cappiello (icappiello) added a comment to T54058: Rigify - Cat setup suggestions/fix. Ivan Cappiello (icappiello) updated subscribers of T52758: Rigify: feature proposal: allow registration of custom rig types. Ivan Cappiello (icappiello) added a comment to T48116: Update Cloud Generator Addon. can you explain why the particle option has been deprecated? i find it very useful. Just reinserted the line removed by this commit and seems to create no problem at all in 2.79b. Is this option really causing issues or what? Ivan Cappiello (icappiello) triaged T58929: Rigify incorrect neck behaviour as Confirmed, Medium priority. Ivan Cappiello (icappiello) reassigned T58929: Rigify incorrect neck behaviour from Corrado Piscitelli (GigiSpligi) to Lucio Rossi (luciorossi). Ivan Cappiello (icappiello) added a comment to T54159: Bake Actions causes skewed bones on Rigify armature. P.S. Given that the position, scale and rotation of the bones is completely overridden by constraints, there is no need for inheriting scale (or anything) in the first place in this case. Ivan Cappiello (icappiello) added a comment to T48892: Rigify Update and Fixes. KiJeon (0o00o0oo) awarded T48892: Rigify Update and Fixes a Love token. Ivan Cappiello (icappiello) added a comment to T56446: IMPORT and/or EXPORT of BVH Files partly making problems see example description (easily verifyable) . rigify is not involved in the issue. The metarig is exported/imported through BVH import/export add-on. Until rig generation (i.e. press the 'generate rig' button) there will only be a simple armature object named "metarig" in the scene. It's not any different from handling any other armature object. Ivan Cappiello (icappiello) added a comment to T53019: Rigify paw IK stretch error and Legacy Mode "paw" missing. Once created, can the pivot point be modified? i think you refer to the original non-stretchy spine since in the 2.78 the super_torso_turbo had the exact same behavior (plus lots of bug and limitations). That kind of spine has been replaced by the new one as default. The only way of using it for now is enabling the legacy mode and use the old method. Sorry but I can not find the pivot slide. I selected each bone in the spine and tail and found only "head_follow", "neck_follow" and "tail_follow". Could you tell me the name of the bone? The spine of the cat looks very good. Should the "Basic Quadruped" or wolf spine work in the same way? indeed it should. And... it isn't. Seems the problem is a prop on the metarig. Ivan Cappiello (icappiello) added a comment to T53024: Rigify Animation Tools not functioning. I can confirm the issue. Trying to rollback to the commit that broke it. Will report results asap. I'm not sure that the spine works well (quadruped rid 2.79). It has only two bones to control the curvature. It is complicated to bend the spine. Sorry for commenting here, I was not sure about reporting this as a bug. Would you mind checking this out? Ivan Cappiello (icappiello) closed T52969: Rigify generation does not work without face as Invalid. Cannot confirm issue. The problem is related to incorrect delete of face bones. All face bones are child of a single bone named “face” that is placed on the same position of “spine.006” (the head bone). If “face” is not deleted and has no child bones (i.e. All face bone are deleted except “face”) the generate process will raise an error. As described accurately in the rigify wiki, all face bones are placed on armature layer 1. To correctly remove all of them it is suggested to make only layer 1 visible, select all bones, and then delete it. if done this way no error will be raised and the rig will be correctly generated. Please read the wiki before posting next time, maybe you can find an easy solution without waiting for answers. Ivan Cappiello (icappiello) added a comment to T50511: Pitchipoy rig, visual representation of keys, don't visible. .
@Rombout Versluijs (rombout), the header was done before the documentation, so the only chance is you missed it. the user has blender2.78 or previous. In this case he can easily see the bundled version is 0.4 and mismatches the documentation header. The documentation and release changelog state also with extreme clarity what's changed in 0.5 (Please Read: What's new in Rigify 0.5) so if the feature you are looking for is in 0.5 updates list he just grab the 2.79 and goes. As long as he can read english i can't see a real problem. the user has blender2.79 or newer. The problem doesn't exist at all. @Rombout Versluijs (rombout) is the official rigify wiki page and, as i wrote previously, there's no other one since it documented for the first time in 0.5. Please look further before posting next time. And stop posting here if your question is not relevant to the topic and you already had support. @Rombout Versluijs (rombout), maybe you missed the first lines of the page. There's a header that states the version of the add-on and the blender release. Rigify 0.5 is bundled with blender 2.79. The documentation is referred to the upcoming 2.79 release. Since 0.5 is a major change and the old rigify was never documented and its code is going to be deprecated anyway, we decided to refer the documentation explicitly to Rigify 0.5. In particular, if you use the IK following option setting it to 0 (Zero), the hand will not follow any part of the rig anymore acting like any other object in the scene, so when the child of constraint is turned off that position should be retained. This could help in particular situations. Keep in mind that this is a boolean value so no interpolation can be done. Moreover this could not work in an already animated file, but i thought it might be useful while planning future animations tough. The main one was with the rig layers panel which after linking all those characters in the scene was not showing up for some of them and for others there was as many panels as there where characters. Ivan Cappiello (icappiello) added a comment to T52158: Rigify. your last post refers to a separate issue. Please do not continue posting in this thread if the content is not related to the bug report you opened, especially if the thread is closed and you do not provide new and useful informations about the reported bug. Moreover, before opening a new thread, please try to use the search field or google for your query. Ivan Cappiello (icappiello) updated subscribers of T52167: Rigify "Rigify Type" lags bone properties panel.. It could be related to some script running in background, or just a graphic driver issue. @Lucio Rossi (luciorossi) @Brendon Murphy (meta-androcto) Can anyone else please confirm this is happening? Ivan Cappiello (icappiello) closed T52158: Rigify as Invalid. first, take in consideration that all the first part of your post is not a bug report. I could take it as a sort of design proposal. I'll take the time to answer anyway but please next time consider that a bug is considered something the program is explicitly meant to do and doesn't. Ivan Cappiello (icappiello) closed T52130: Issue With Pitchipoi Rigify Armature as Invalid. A Vertex Group doesn't appear until you click in the view port and the bone seems to have no weighting. Ivan Cappiello (icappiello) added a comment to T51964: Can't sort Linked objects transparency in viewport. @Bastien Montagne (mont29) since 2.79 is going to be last stable build till the official 2.8 release, i thought it could be worth a look at this patch since, even if doomed, BI will stay as long as needed to make 2.8 stable. What benefit could come from not having a workaround for that issue in 2.79 as long as it doesn't break anything else? @Paolo Acampora (pkrime), i remember you wrote for us a patch to fix that while we were rendering our animated feature GL previews. I think it's here https://developer.blender.org/T48983. @Bastien Montagne (mont29) We are stil using it in studio, even if rejected (and still unclear to me why) i think it could be at least a good starting point to address the issue, can you please consider it? Ivan Cappiello (icappiello) raised the priority of T51930: Rigify FK to IK is broken (2.78 Pitchipoy and 2.79) from Normal to Confirmed, High. After a first look it seems something has changed in the way blender handles the snapping functions. Ivan Cappiello (icappiello) added a comment to T51930: Rigify FK to IK is broken (2.78 Pitchipoy and 2.79). I can confirm the issue. Causes are still unclear. We are investigating right now. Ivan Cappiello (icappiello) closed T51928: Rigify (2.79/daily) auto-calculates incorrect bone rolls as Invalid. The option is on the limb's first bone in the metarig. Just select it (upper_arm.L i guess) in pose mode and switch from automatic to the axis you want. Default is X. Then you have to take care of bone rolls though. Ivan Cappiello (icappiello) placed T51930: Rigify FK to IK is broken (2.78 Pitchipoy and 2.79) up for grabs. Ivan Cappiello (icappiello) updated subscribers of D2713: FBX import characters with bone weights exceeding 1.0.
hey @Brendon Murphy (meta-androcto) can you please have a look at this? Ivan Cappiello (icappiello) closed T51729: Rigify UI doesn't show when linking in more than one character as Resolved. closing the tasks as resolved since rigify 0.5 addresses all 3 issues. Ivan Cappiello (icappiello) added a comment to T51757: Keys for FK/IK sliders not visible. .
i am closing this task as invalid since it was already reported, fixed and, after a double check on commits there's no trace of other issues introduced by recent commits. Ivan Cappiello (icappiello) closed T51757: Keys for FK/IK sliders not visible. as Invalid. I remember the issue. We never fixed that in legacy mode. Legacy mode is intended to maintain the legacy feature unchanged during the migration to new 0.5 code. The reported issue is related to rigify's original design, we took care of it redesigning the rigs in 0.5. Ivan Cappiello (icappiello) added a comment to T51729: Rigify UI doesn't show when linking in more than one character. there's more than a issue here. @Julien DUROURE (julien) with the next 2.79 release all your requests should be addressed. Have a look at the release notes and follow the upcoming wiki page to know how to use it. Ivan Cappiello (icappiello) closed T51094: Rigify: choose regenerate target by rig_id, and clean WGT- objects up after generation and fix minor bug as Invalid. Ivan Cappiello (icappiello) added a comment to T51094: Rigify: choose regenerate target by rig_id, and clean WGT- objects up after generation and fix minor bug. Seems you are writing the rig-id on the meta-rig and then the meta-rig passes it to the rig. Even if the idea seems cool at a first glance, again, the consequence of this change are breaking other rigify features. It seems you never generate again the rig-id on the meta-rig once is created. This is bad. Rigify metarigs are created to be shareable through blender files. For example, you have rigged your character with rigify, the next one is similar to the first, so you append your meta-rig form the first to the second file, then edit it as needed and generate. Standing to your patch in this case the metarig will bring in the second file the same rig id and - even not finding the rig itself - will always generate rigs with same rig-id. Since there is no rule to know when to re-create the rig id, you will force the user to manually delete it. The idea behind the patch is good though. I'll try to think a workaround for this second part, but for now -as this patch is submitted - I consider this part rejected too. looking into the patch right now. Ivan Cappiello (icappiello) closed T50511: Pitchipoy rig, visual representation of keys, don't visible. as Resolved. This is fixed in 2.79. Now the property is moved to a visible bone laying at the base of the limb. New rigs created starting from 2.79 code will work automatically. Old rigs should be upgraded re-assigning the rigify-types property in pose mode. Ivan Cappiello (icappiello) added a comment to T50607: Rigify (Pitchipoy) arm rotation popping/rotating problem in IK. This is the metarig i re-created from the ORG-bones in your file. That's how the arm bone should be oriented to make it correctly work. You can restart from there. Ivan Cappiello (icappiello) closed T50607: Rigify (Pitchipoy) arm rotation popping/rotating problem in IK as Invalid. on the the sample file i see more problems than you reported. Most of the controls are turned in the rest pose and there is a dependency cycle on the right leg. I suspect the metarig is misaligned or some modifications were made after the rig-generation. I can see from the ORG-bones (that are the exact metarig copy) that your arms have bone rolls not correctly aligned. the Z-axis should point downward, in your rig instead is flipped. You can go in the front view (numpad 1) select the arm bone-chain on the metarig and hit CTRL+N > Recalculate Roll > View Axis. Then regenerate the rig. please provide the blend file with the metarig that's generating the error. And a detailed description. About the finger, have you tried to replace basic fingers with the pitchypoi super finger? That should do exactly what you asked for. Not sure it's a complete solution tough. Then if hand_fk is not visible the problem remains. I guess exposing a separate bone at the limb's first bone to handle all the properties is a better idea. This bone can be on both FK and IK rig-layer meaning it's always visibile if at least one of them is. Will look further into that. You can use the method you prefer. Rigify can make mixed rigs. I can confirm the bug. Looking if @Joshua Leung (aligorith) 's fix is breaking something else. Ivan Cappiello (icappiello) closed T49317: Rigify - biped.leg Sample not working as Archived. Ivan Cappiello (icappiello) added a comment to T49317: Rigify - biped.leg Sample not working. Following those steps i can't reproduce this error on 2.78a. All DEF and ORG bones are on the respective layers and correctly displayed. We could have a fix that adds the feature you requested on the pitchypoi leg. I looked into the FK toe snap problem.